Johnson Chong is a native New Yorker of Chinese refugee parents. For the past decade, he's taught yoga, meditation and spirituality internationally and is a passionate Spirit Coach and InnerGuide. 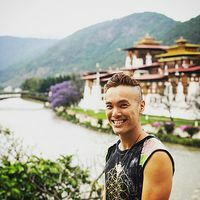 Sage Sapien follows a second generation Asian American gay man struggling with stress, abuse, self-hatred, cultural identity, as he moves on a spiritual path of becoming whole.